This is part one of a three-part series on data clean-up and optimization. In this blog post, we will cover the work that is being done on maps. This is a first milestone that will allow us to optimize stability and frame rate, while maintaining visual quality. 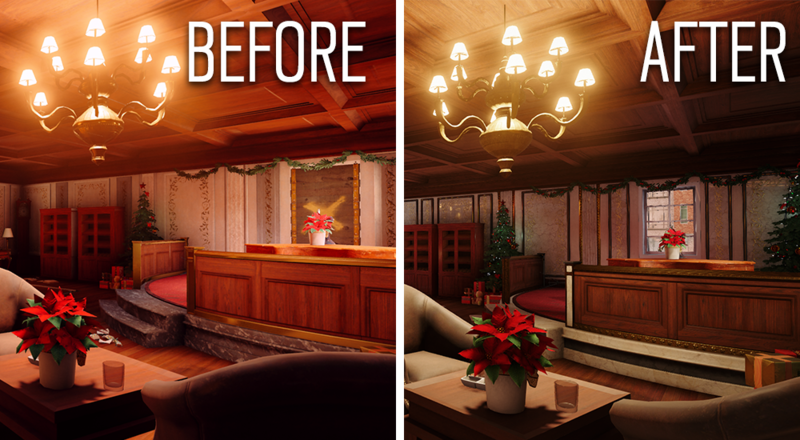 Once these changes go live in Year 2 Season 3, you will notice a few material changes on Kafe, as seen below! 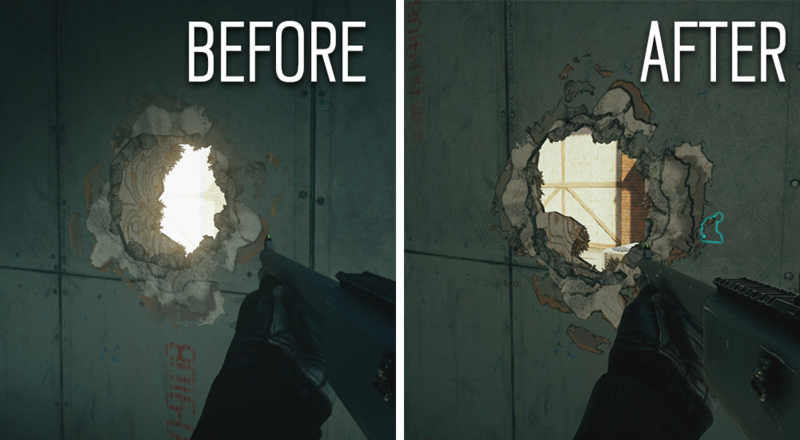 We are targeting texture and meshes cleanup for all maps within the next year. 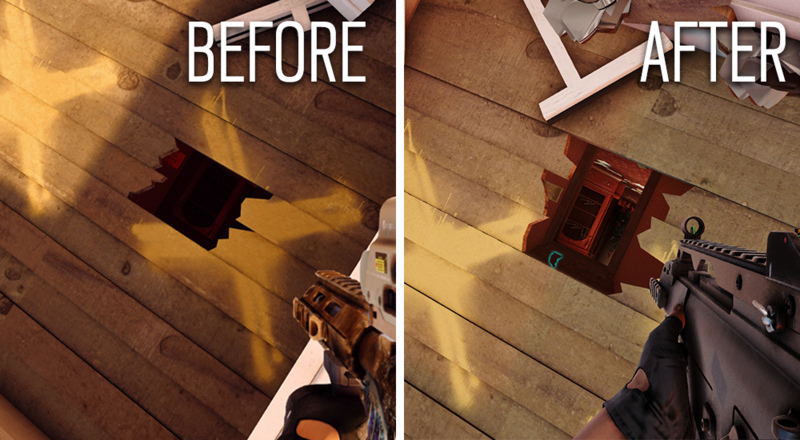 Rainbow Six Siege is built around the concept of a fully destructible environment. As such, we needed to develop a lighting system that works well in tandem with the changes that come from having that level of procedural destruction. To deliver this type of system, we use both dynamic lighting and static, indirect lighting. Not only that, but we also have multiple post-effects which control the brightness and color of what you see displayed on your screen. All of this works together to help build the atmosphere you enjoy in game. All of that being said, we have heard your complaints regarding lighting, and how it can sometimes negatively impact your experience. We are currently looking at implementing the following changes. 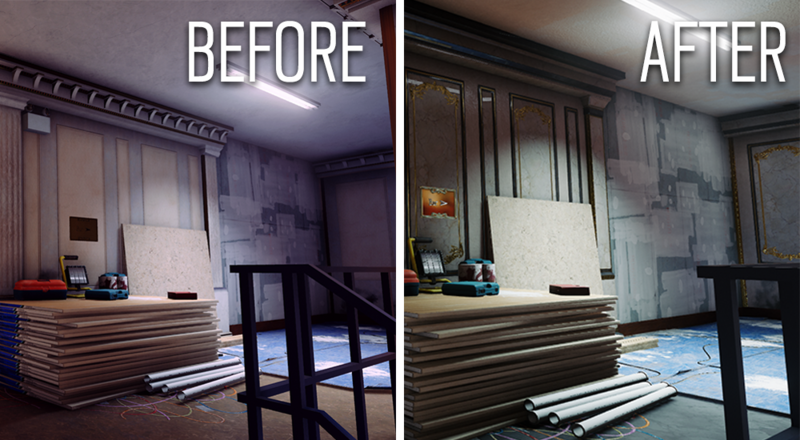 Initially, we wanted to use realistic values to have contrasted and realistic lighting, which works in the same way as a camera would in real life. 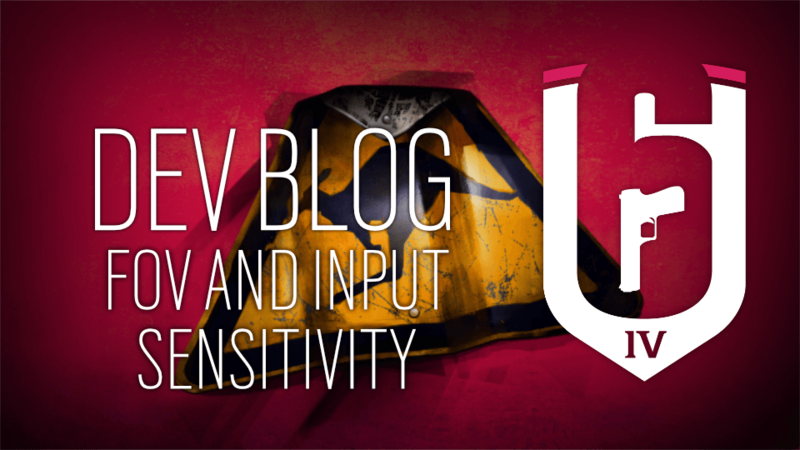 Additionally, the bloom was intended to limit the effectiveness of Defenders peeking outside. We are excited to tell you that we have completely reworked how exposure is handled on all maps, and reduced the exposure values. Bloom issues are now a thing of the past. In an effort to deliver a more immersive experience, we used procedurally generated skies tech from Assassin's Creed. This tech is great for providing us with dynamic time of day, but it wasn’t a perfect fit for our game as we only have two static times of day. 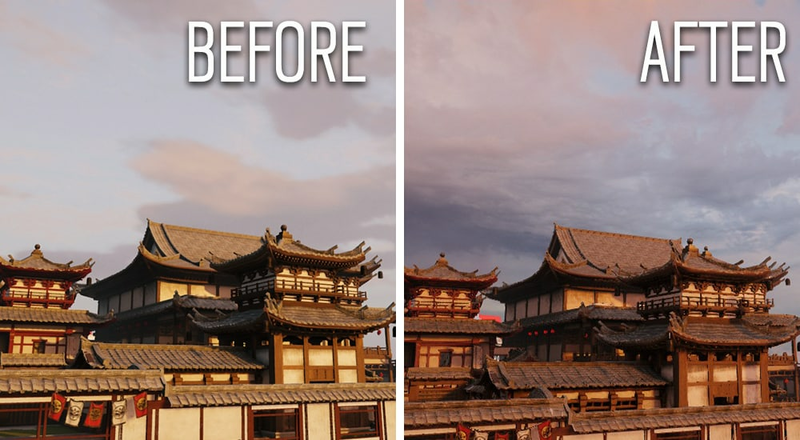 We will now be using image based HDR skies. This allows us to have more artistic control of the ambient lighting, as well as increase the overall quality of lighting in general. Updates are being worked on for our shading model, also known as Bidirectional Reflectance Distribution Function, which calculates reflections. It now matches the same model as our external texturing tool, which improves the workflow for our artists. What this means for you is that you will see an improved reflection quality in some materials, particularly in terms of glossiness. 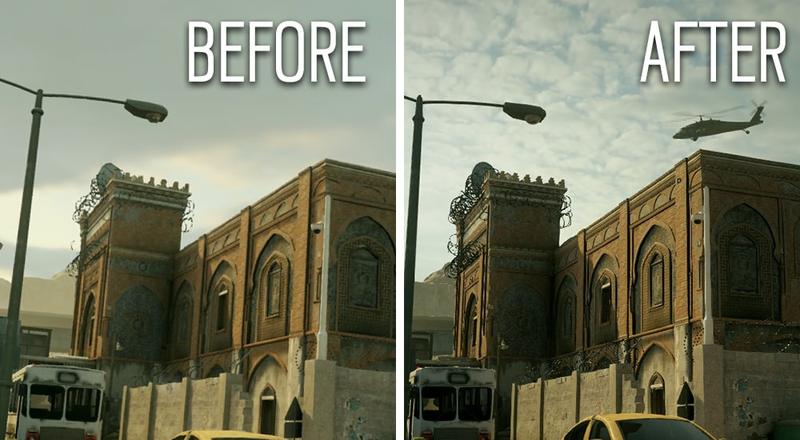 We hope that you enjoyed learning a bit about what goes into the creation of a map, and more specifically the lighting. 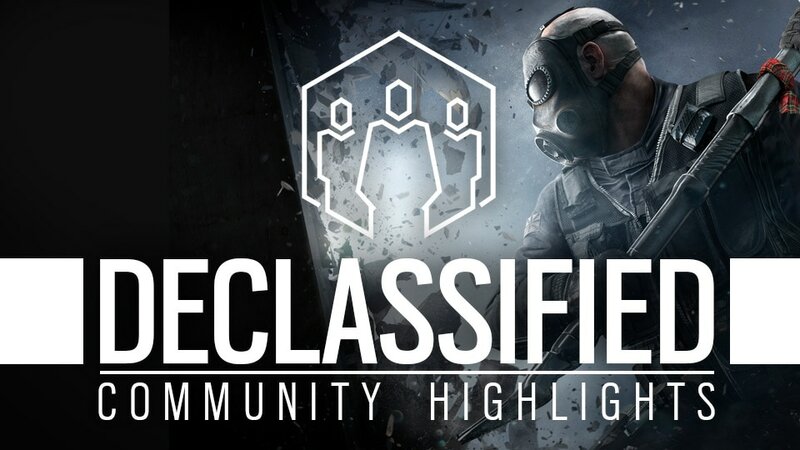 The next blog that we will be sharing with you will focus on our data cleanup for Operators! We would love to hear your thoughts on this blog, so join the discussion on Twitter, Reddit, Facebook, and the forums!